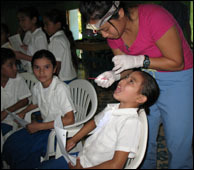 My trip to Honduras consisted of a wide variety of work ranging from direct patient care to public health assessments. The first stop was a 4-day stay with the community of Colomarigua, Concepcion. This is a remote community that has not been visited previously by Shoulder-to-Shoulder. The goal of our visit was to establish a relationship with the community and encourage the formation of a Colomarigua-based committee, which would guide the focus of future brigades. Our clinic work was primarily directed at children's health. We set-up our clinic in their primary school and performed complete well-child checks on all of their schoolchildren (~150 students). Our exam included anthropomorphic measurements to assess nutritional status, eye exams, teeth cleaning with dental varnish, peak flow measurements, hematocrit measurements, and general medical consults. We found that malnourishment and parasite infection were common in this community. Other interesting cases included a newborn with large, bilateral, inguinal hernias, several cases of botfly infection, and one case of a symptomatic cardiac defect. We also provided general adult consults and performed visual inspection with acetic acid (VIA) screening for cervical cancer on the women of the village. My next stop was a 4-day stay in Concepcion. There, I divided my time on two projects: partera (midwife) classes and a reproductive health survey. We had two midwife classes, which focused on teaching basic anatomy/physiology knowledge to the lay midwives and assessing their procedures for a normal delivery. The classes revealed a wide range of midwife training and experience. We brought a pelvic model and drawings to identify the major internal and external organs. The midwives found this task challenging, but were extremely excited to learn. The midwives, though varied in their fundamental understanding, performed deliveries in a fairly uniform manner. During our discussions, the midwives expressed interest in learning more about non-medical interventions for labor pain, the lack of prenatal vitamins, the lack of materials for a clean delivery (gloves, cord ties, plastic bags for cleaning), and inconsistencies in performing uterine massage after delivery of the placenta. We also performed a reproductive health survey directed at women between the ages of 12-35. The surveys assessed the knowledge and use of various family planning methods, the presence of domestic violence, and history of sexually transmitted diseases. It was generally found that women <18y/o had very little knowledge of family planning, but that women with several children were aware of contraception, most commonly Depo-Provera. There were also many myths about contraception including thoughts that they hurt the body, making it too weak and fragile to be able to have children. Others expressed fears that if pills were taken, then the baby would be born with the pills stuck to their body. Domestic violence also seemed to be prevalent in the community. Most admitted to knowing a situation where there was domestic violence. Few had history of sexually transmitted diseases, though Concepcion committee members stated there are 5 known cases of AIDS in community. I found my experience in Honduras to be extremely rewarding. I plan on returning to these communities in February 2008, using the information I have gathered from this trip. In collaboration with the Concepcion committee of Shoulder-to-Shoulder, we have planned to conduct further classes with the midwives, targeting their weakest areas of knowledge. We will also organize classes on sexually transmitted diseases to teach to their community leaders and teachers, as a primary avenue to begin discussing sexual health. I thank you for your support on this trip and appreciate the opportunity this fund provides for all medical personnel.